Ethical hacking and ethical hacker are terms used to describe hacking performed by a company or individual to help identify potential threats on a computer or network. Hacking is illegal and can lead to extreme consequences if you are caught in the act. People, who hack into a system with permission, without any malicious intent, are known as ethical hackers and the process is known as ethical hacking. The purpose of ethical hacking is to improve the security of the network or systems by fixing the vulnerabilities found during testing. 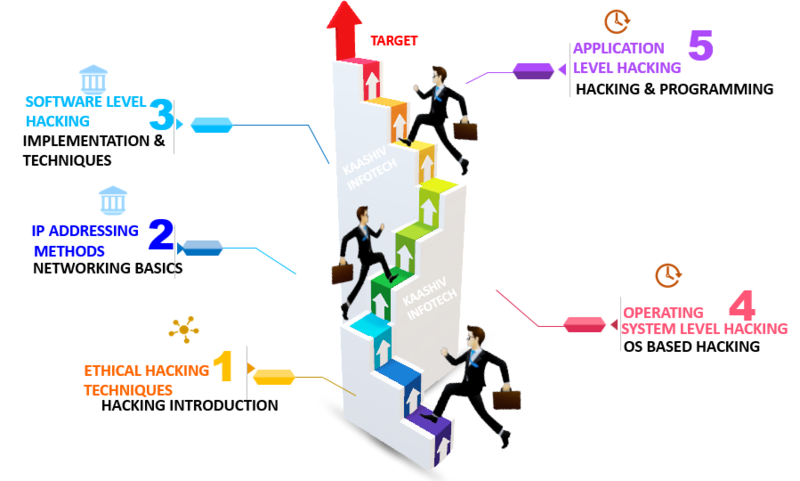 Why KaaShiv InfoTech Company to learn Ethical Hacking Training in Chennai? Kaashiv provides Best Ethical Hacking Training in Chennai with professional trainers who provide real-time training and also projects to the candidates for better understanding. Why Students Ethical Hacking for real time Ethical Hacking Training in Chennai ? Ethical Hacking sometimes called as Penetration Testing is an act of intruding/penetrating into system or networks to find out threats, vulnerabilities in those systems. The job of an ethical hacker is to penetrate into a system in order to check the security and protection of the company’s IT system. Ethical hackers are highly trained professionals, who can penetrate into any type of IT system be it an individual or a company’s system. A career in ethical hacking can be very rewarding when compared to other jobs. There is good Career growth in ethical hacking. Learn and Implement 120 Concepts Covering Ethical Hacking Basics to Advanced. Students undergone Ethical Hacking training will be expertise in Ethical Hacking Specialist & Ethical Hacking Programming. For Ethical Hacking Training 120 concepts from Basic to Advanced will be covered.